The UK "is fast becoming the biggest consumer of cocaine in Europe", the security minister has said. Ben Wallace said the "high-margin, high-supply drug" was "fuelling" an increase in violence on the streets. Technology had enabled young dealers to evade detection and order drugs direct from "serious" gangs, he told MPs. The minister said he was "not deaf" to Labour claims that police cuts had increased the pressure on officers trying to deal with the problem. Labour MP David Lammy warned of more killings in London if the authorities did not take urgent action, adding that ministers must ask themselves "do black lives matter?" The Tottenham MP has previously linked the spike in London's murder rate, with 67 killings so far this year, to the cocaine trade. He warned MPs the murder rate could rise to 100 by the autumn and he could not help thinking that more attention would have been paid if this level of violent crime was happening in a "leafy shire". The minister said the ubiquity of smart phones and growth of encryption had, increasingly, cut out the "middle men" when it came to international drug-dealing. "Young people have the ability to order drugs, and gangs have the ability to have delivered to their door large packets of drugs from Albanian or Serbian drug gangs, or indeed from local drug gangs," he said. Cocaine was, he said, no longer "the preserve of the yuppie or the rich" and its increasing use in rural communities such as his Lancashire constituency was causing turf wars between different criminal gangs as they sought to enforce their so-called "county lines". "It is a high-margin, high-supply drug at the moment, and that is fuelling that increased violence. "With those serious organised criminals...they don't just put a 15-year-old in a house or they 'cuckoo' the house; they provide a weapon to enforce the drug line. "And sometimes, if the 15-year-old is not a willing participant, they will ruthlessly enforce that county line with violence, and they will kill those people and they'll kill the local drug dealers if they get in their way." Promising that new measures to crack down on the possession of knives and a consultation on extending stop and search powers would be brought before Parliament within weeks, Mr Wallace warned the UK could not "arrest our way" out of some of challenges it faced. "I wish I had more money," he said. "I didn't come in here to cut things. There is sometimes a suggestion that we had a choice and we chose not to spend money." David Lammy, said demand for drugs was "driving violence" and young people living on estates were picking up knives not because they were gang members but because they feared for their lives. "They are hiding them in bushes on the way to school and they're finding them on Saturdays and Sundays because they're scared," he said. 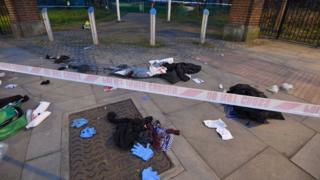 The Tottenham MP suggested there was a racial dimension to how the issue was being treated, questioning whether the authorities would be talking about awareness-raising exercises and funding for at-risk children if "50 or 60 white middle-class young people were killed in Surrey or Kent in the space of five months". "This debate must also quite properly, as it has already done, land on the issue of whether in fact black lives matter in this country. "If we don't solve this problem by the autumn we will be over 100 - you heard it here first - young people, more than New York, dead in this country. "Do black lives matter or not? That is the question for the minister." His colleague Lyn Brown said for the past year her East Ham community had been "haunted" by violence as she read out the names of the nine young people killed since the start of 2017.